The First Access Visa Card currently has an Informr score of 6 out of 10. This score is based on our evaluation of 4 sources including reviews from users and the web's most trusted critics. 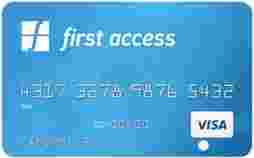 First Access Visa Card is typically available to those with poor credit scores (650 or greater). The First Access Visa® Card comes with a significant price tag. Before shelling out the money for it, consider opening a secured credit card instead. Bank of Missouri’s First Access Card is designed for those with bad credit scores. While the fact that your credit limit can go up after 6 months, its high fees make it expensive for cardholders. The First Access VISA® Credit Card has many fees and a high APR that make its alternatives more appealing. But, if you have been declined by other issuers due to your poor credit score and financial history, there is still a good chance that you will be approved for this card, and it is worth applying. The First Access Visa Credit Card should be avoided unless you truly have no other options available to you. Its fees are unreasonable and there are many other ways to start rebuilding your credit without paying hundreds of dollars in fees. You’ll be better off taking the money you would put towards the First Access Visa Card’s fees and use it to make a deposit on a secured card.